I woke from an awful night's sleep due to the fridge in the room sounding like a Boeing 747 idling. I made several attempts to unplug it, only to find that it was wired direct into the wall. I could stop the noise by opening its door, but then the room lit up like a grotto. So, with the fridge quiet - and spare pillow stuffed in the door to blackout the light, I finally nodded off to be immediately woken by my alarm. Breakfast on the hotel terrace was nice, but it was hot already at 7-30am - today was going to be tricky. We hit the road knowing there were some hard climbs - but God in heaven, I wasn't ready for these. They call the region Alpes Maritimes for a reason - and by our mid-morning Maccy Dees stop we were both weary and bad tempered. Finally, the old town of Grasse came into view at lunchtime, but due to another dodgy bit of map and Garmin reading we ended up climbing to the very peak of Grasse - both out of food and water. 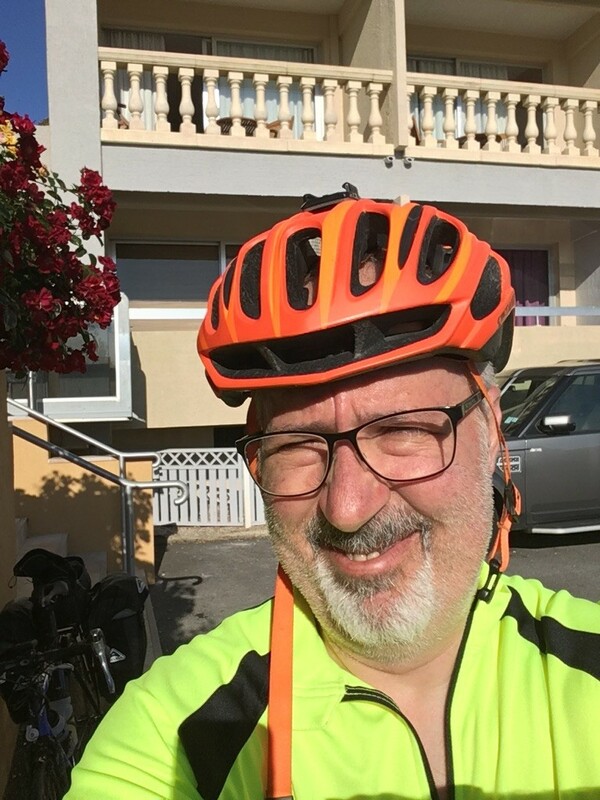 The loosely made plan was to stop at an Intermarche supermarket en route and stock up - but as I was quite a way ahead of Dave, and I saw a Casino supermarket that was more en route but about 1km further on - I headed for that. I waited, and waited - then became worried, and then noticed Dave had tried to call me. When I eventually got through some 20 mins later he cheerfully informed me that he was in the checkout queue buying groceries and where was I? I was incandescent with rage - not for any reason other than I was very thirsty, was waiting (again) for Dave to appear, and couldn't believe he'd just stop without me. All totally irrational, and like a toddler having a strop - I gave him what for when he finally rolled up. He allowed me the customary simmering time, then we shook hands and sorted it out like chaps do. 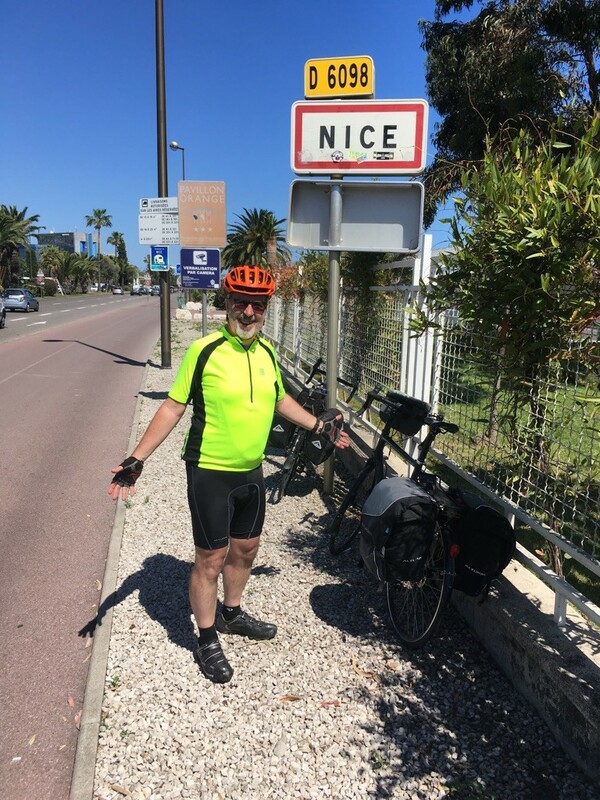 From there it was literally a 15 mile roll down to the coast, just west of Nice airport - and after finding out where we'd be able to get bike boxes on Saturday at the airport itself - we found the sign welcoming us to Nice. Hurrah, the mission is accomplished. I shall probably report on some journey stats and our antics while we're here for the next three days - but for now I can hear Dave showering in the room above mine. I believe it's Barry Manilow's 'Mandy' he's humming.